This blog is posted in two parts. They have an annual theatre festival in the village of Pitlochry in Perthshire, Scotland. My husband and I decided to take a long weekend, see a few shows and explore Perthshire. The Scottish countryside is renowned for it’s beauty. It’s a combination of mountains and forests with streams and rivers that feed into their salmon filled lochs. The natural environment is a big part of the attraction to Scotland, but that’s not all. There are castles aplenty, scenic drives, walks, museums, views, craft shops, whisky and beer tastings and stone circles to see and do. But just hanging around a pretty town like Pitlochry, enjoying local produce and listening Scottish accents was also on our agenda. Apparently Scottish and Irish accents are the ones we most love to listen to. 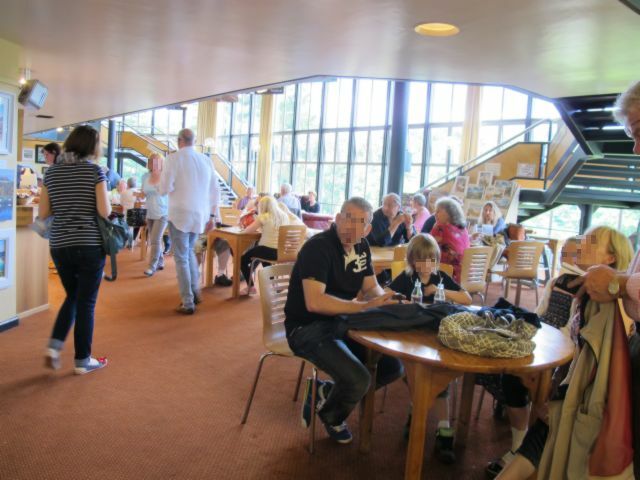 The – Pitlochry Festival Theatre – began in 1951 and the show was initially housed in a tent. Today they have a proper theatre which is located right next to the Tummel River. It has large windows with views of the river and you can relax in their cafe with a glass of wine and a snack, or have a three course meal before a show. Try to avoid visiting July and August when the Scottish schools are on holiday and the town is heaving with humans. The theatre has a group of actors who mix and match roles in their various productions. We chose to see – 39 Steps – and – Communicating Doors. My husband booked our tickets on-line. Tickets were £28 each. We had lots of time to get from Aberdeen to Pitlochry as we weren’t traveling far, so we set our Tom Tom to shortest route as opposed to fastest route. That way we could take in a few little villages en route. Visit Scotland – have brown road signs that clearly show the local – scenic drives, which is handy if you want to see more than a highway. The trip from Aberdeen to Pitlochry took around 2 and 1/2 hours. We booked a Chevy Spark on-line with – Enterprise Rent a Car. The car cost £55 incl VAT for 3 days. On this occasion my husband skipped the £10 per day insurance. We travelled about 250 – 300 miles and petrol bill for the weekend was £30. The Tom Tom was our own. 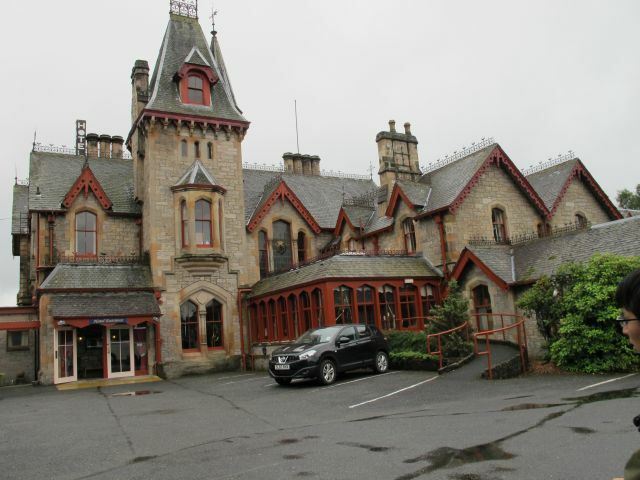 We checked into – Dundarach Hotel – in Pitlochry just after lunch. There was time in hand to go walkabout and collect our tickets before we got ready for the theatre. 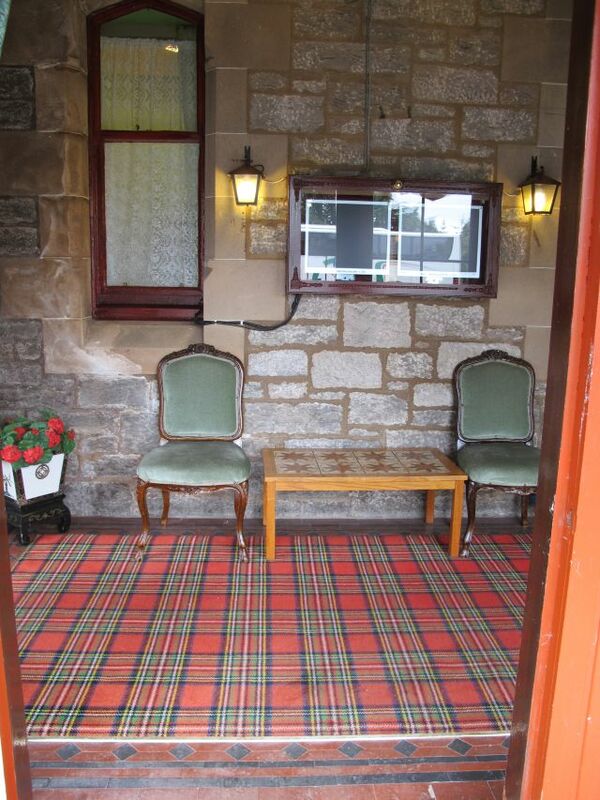 The Dundarach Hotel cost £100 per night for two of us. We normally would go for cheaper accommodation but there wasn’t much available. This is a popular event and advance booking to get bargains is a prerequisite. You can try – Late Rooms, Booking.com, Farm Stay UK, Scottish Independant Hostels, Hostelling Scotland – for links to accommodation. At the Pitlochry Theatre Festival ticket office we discovered that, not one, but two cast members had been hospitalised. Gasp. They cancelled one of our evening shows but juggled a matinee performance of – Little Shop of Horrors – for us instead. We thought we would book a meal at the in-house restaurant but also discovered the restaurant was booked up a year in advance, so that took care of that idea. 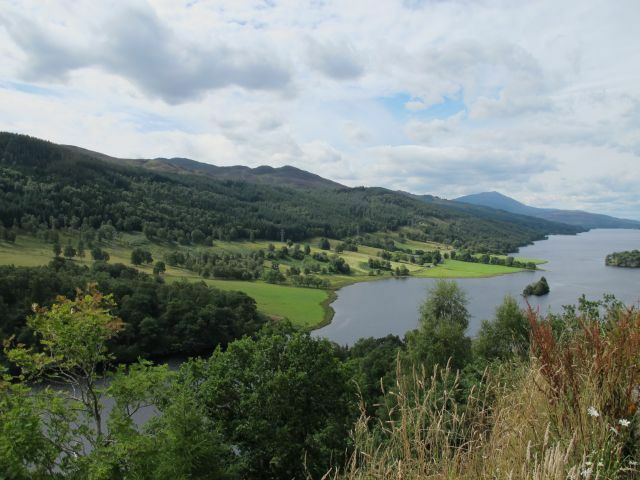 What to do and see in Pitlochry? It’s very, very touristy. Lots of tour buses pass through and hoardes of people with back packs, bum bags and cameras roam the streets. Pitlochry is free of mega development and retains a quaint old village charm. Lovely old granite stone cottages line the streets and it’s all postcard pretty. Walking around the village and then relaxing with a cup of tea with a slice of local cake is a pleasant way to spend the afternoon. Try – Hetties Tearoom. The canny Scots use their natural geology to their advantage and have created hydro electric schemes all over the country. There is one such scheme at Loch Faskally. And that’s not all, to preserve their salmon numbers, they have incorporated a ‘fish ladder‘ so salmon can swim upstream to spawn. 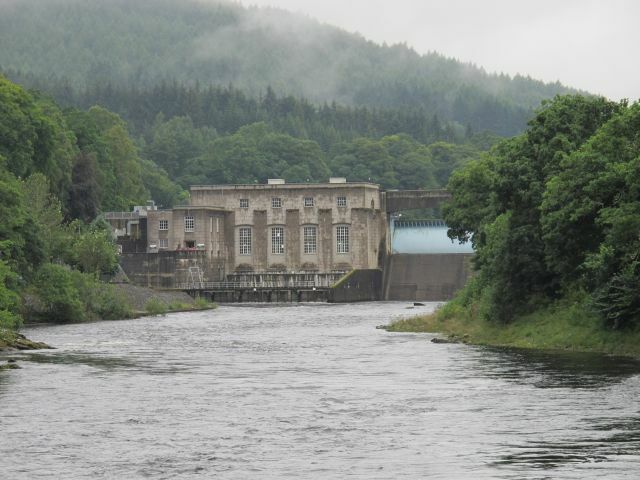 We visited Loch Faskally and saw the hydro electric scheme. The mechanics are interesting and the loch has not been spoiled with an ugly industrial building but rather a subtle arrangement in keeping with the local area. 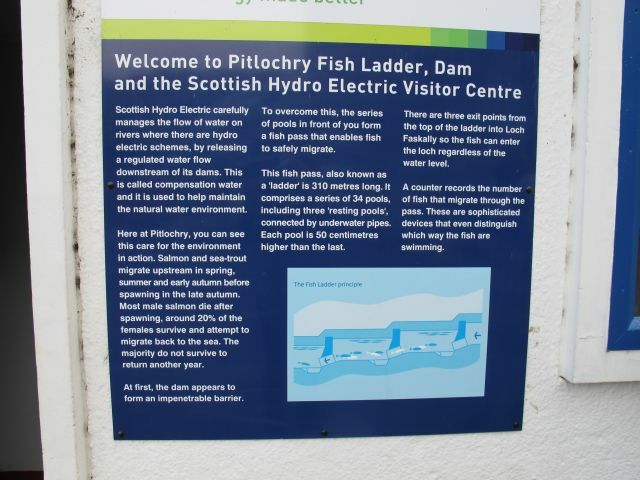 The fish ladder is more a sort of tunnel beneath some steps that the fish can swim through. They have a viewing area where you can watch and count the salmon as they swim past but they were shy when we tried to see them. You can take in a – whiskey tasting – and tour at the home of Bells at – Blair Atholl Distillery. A basic tour costs around £6. 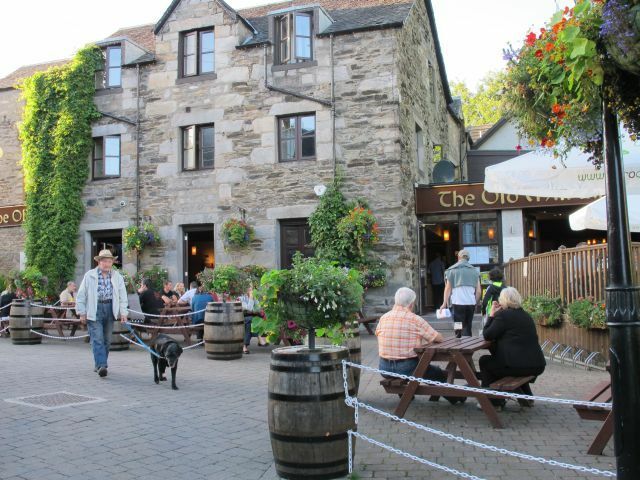 Moulin Inn have a brewerey where you can see a local micro brewer make – Braveheart Ale. The tour is free and I am told you get a complimentary bottle of ale after the tour. Next week in – Part 2 – I deal with Blair Castle, Loch Tay, Loch Tummel and the towns of Kenmore and Portingall. ﻿Go to – My Holidays and Trips – at the top of this page to read about other places we have visited. Or just click on – this link.